You're probably wondering why I'm posting a rhubarb recipe when I just finished saying Spring was on it's way out... Well, rhubarb was totally late to the party this year, and can still be found at markets throughout Toronto. 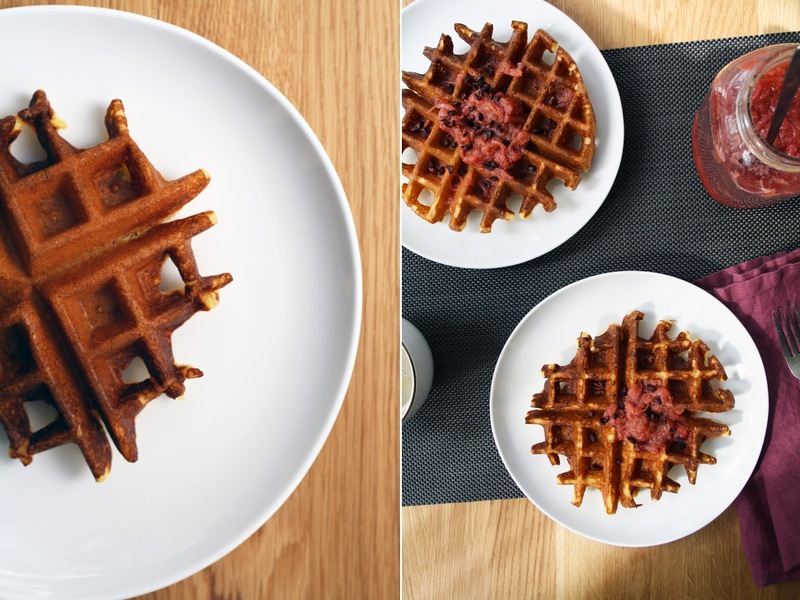 I made this rhubarb compote to top my birthday breakfast waffles a few weeks back, and have made it so many times since, that I knew it needed a spot on the site. The perfect tart to sweet ratio makes this compote ideal for topping waffles, plain yogurt, fruit salads, you name it! Combine it with lightly toasted cornmeal waffles, a little crunch from the cacao nibs, and you have yourself a winning weekend breakfast! PS. thanks to the gaggle for my beauty new place mats. *note: or 1 cup buttermilk, if you have it. Start by making the compote. Combine the water, sugar and vanilla in a saucepan on medium-heat. Allow the sugar to dissolve completely, then add the rhubarb. Bring to a boil, reduce to a simmer, and cook, uncovered, for about 10 minutes - stirring occasionally to break up the larger pieces. After 10 minutes, assess the amount of liquid in the pot. If desired thickness is achieved, remove from the heat, if not, leave it to simmer for a little longer. Turn on your waffle iron and allow it to heat up while you make the batter. Add 1 T white vinegar to a measuring cup; then fill with milk to the 1 cup line. Allow to sit and curdle (skip this step if using buttermilk). In a large bowl, combine all the dry ingredients and stir to combine. In a separate bowl, whisk the egg, then add the buttermilk, honey, vanilla and room temperature, melted butter; whisk to combine. Transfer the wet ingredients into the dry and using a wooden spoon, stir just until combined. Scoop 1/2 cup batter onto the hot waffle iron. Shut the lid and let bake until browned and crisp (~5-7 minutes depending on your iron). Continue the same way until you've made 4 or have used up all the batter. Be careful not to stack the waffles as you make them or they will get soggy. Serve warm, with a heaping scoop of rhubarb and a sprinkle of cacao nibs.